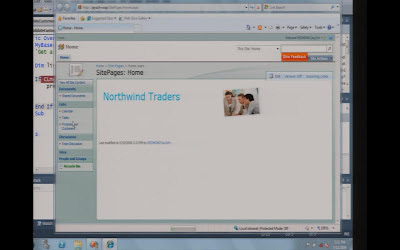 This seems to be a popular post for those looking for information about AJAX applications in SharePoint 2010. 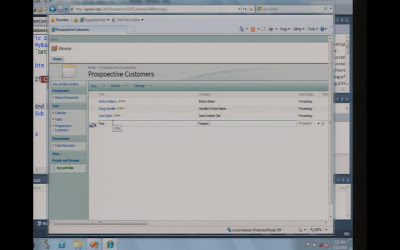 If this topic interests you definitely check out my multi-part series Client Side AJAX applications in SharePoint 2010. In case you aren't aware, the details of SharePoint 2010 are under tight wraps. If you asked any of the presenters at Tech Ed the typical response was "No idea what you're talking about." But that doesn't mean presenters didn't occasionally slip up or say more than they probably should have. This was announced at TechEd by Tom Rizzo, director of Microsoft SharePoint Server, as posted in this InfoWorld article and also on the SharePoint blog. "Sharepoint 2010 to have inline list ajaxy editing." I learned this one during the Q&A session of the "Automate Business Processes Using InfoPath Forms with Integrated SharePoint Designer Workflows... All without Coding!" talk. It’s currently a pain point that workflows developed in SharePoint designer can’t be reused in the same way workflows developed in Visual Studio can, so this will be a wonderful new feature. Apparently MOSS only shipped without this feature because it hadn’t been thoroughly tested. That there has been plenty of time to test this feature by now, so it’s a pretty reasonable assumption that it will be in the next version. Microsoft supports two AJAX approaches: client side and server side. The server side uses the UpdatePanel control where you code as usual and everything magically gets AJAXized. The client side version is part of the unreleased ASP.Net 4.0, but ties in tightly with JSON provided by the .Net Data Services API that was released in the .Net Framework 3.5 SP1. The SharePoint team could have used the server side approach, but why not use the latest technology available, speed up UI significantly, and simultaneously allow web part developers a fantastic level of client side AJAX support? If they made the entire SharePoint API available via the .Net Data Services API it would enable some powerful fast AJAX web parts. It would be awesome. Finally, the only other tidbit isn’t a secret at all, but what I consider to the most exciting feature of Visual Studio 2010: it will support editing SharePoint solutions without editing XML. I hate XML, so that will be wonderful. So are you ready for SharePoint 2010 today? I sure am. Pity about the wait. I did short presentation on Code Access Security (CAS) a while ago and put together a cheat sheet to help remember the terms and how they fit together. It includes screenshots of the .NET Framework 2.0 Configuration tool (in Control Panel\Administrative Tools) and uses Entity Relationship Diagram (ERD) Notation. I had to pull it up recently and figured others might also find it helplful.